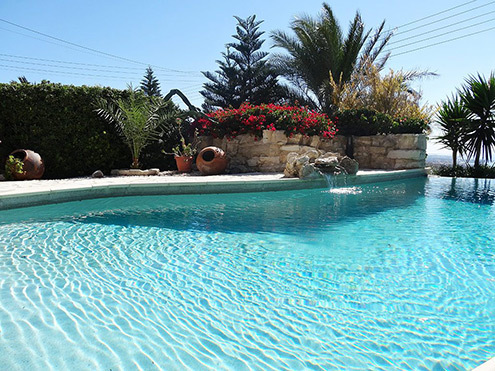 Available for rent is either of our two neighbouring luxury villas, each with their own private infinity pool, offering the ideal place for a truly unforgettable Paphos villa holiday. Beautiful, spacious and luxurious, these are holiday rental villas that you’ll want to return to time and time again. 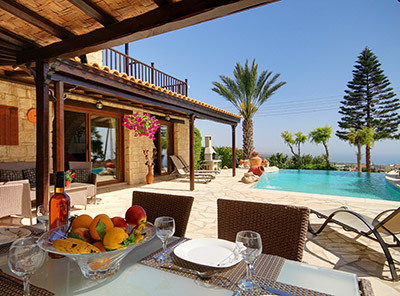 Cyprus – the jewel in the Mediterranean, with an average temperature of 24°C and almost 330 days of sunshine per year, is the perfect location for a superb family villa holiday. We are located in in the traditional Cypriot village of Peyia, overlooking Coral Bay and it’s popular beach, in the Paphos area on the west of the island. Our villas are conveniently located only 30 minutes from the Airport, 15 minutes from Paphos town and 5 minutes from Coral Bay. Both villas have stunning panoramic views of the coast and mountains, being two of the best available in this area. The centre of Peyia village is within a 5 to 10 minute walk, where there are several bars, tavernas, take-aways, shops, banks, supermarkets and other amenities. Many guests rarely leave the villa and village. Both villas are neighbouring but each retaining privacy. With their own private landscaped gardens and spectacular Infinity Pools, both have panoramic sea and mountain views, which can be admired from both the pool area and the large balconies off the bedrooms, complete with separate outdoor furniture. Both villas are light and airy. As they are built in traditional stone, each villa is cool in the summer and warmer in the winter. However air conditioning and central heating is available in each room at no extra cost. Read our reviews, guests agree that a holiday in our villas really exceeds their expectations. We do everything we can to ensure that you have a holiday of your dreams. Why not experience it for yourself? Each villa has the following amenities:. “Brilliant from start to finish” So flippin good, we have booked to go again in September. The whole holiday had one big fault, and that was we had to go home! Would highly recommend this villa and the area it was in, a family full of happy customers! “Beautiful villa with a stunning view” We had a fantastic stay at Villa Harmony. Everything is as is advertised & shown in the photo’s. We would most defiinitely like to return to this lovely villa again in the future. “A lovely stay in an incredible villa” We had an excellent stay in this incredible villa. The villa offers 5 star commodities, beautiful spacious rooms and spectacularly scenic views. We would recommend this villa without hesitation.